We all remember trying to decide what we were going to do after high school and how to make it happen. It can be overwhelming. But at Canby High, the ASPIRE team helps students navigate those dilemmas and more. ASPIRE is an Oregon program that depends on community volunteers to work individually with students to help them plan and prepare for their post-secondary goals. "[It's] just encouraging these kids to be successful, whatever that might look like," said Brenda Kaufman, a volunteer mentor for the program. Some ASPIRE programs have 50-60 volunteers. Canby has four. Laurie Bailey, CHS's ASPIRE coordinator, is hoping to have 10 by the end of the year. Students first encounter the ASPIRE program as sophomores. Sophomores are required to take a Future Focus class, and at that time, a permission slip goes home that, when signed by parents, allows the ASPIRE team to touch base with the students when they are juniors and seniors. 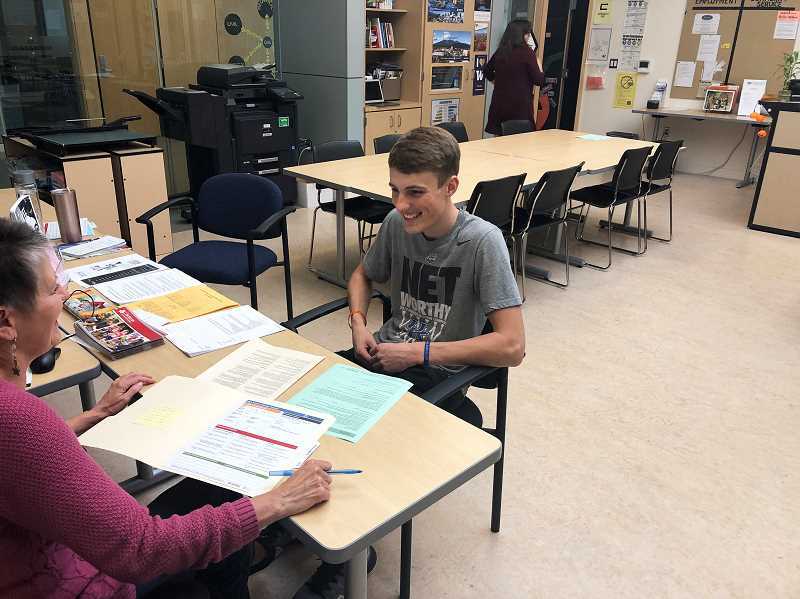 Volunteers simply sit with juniors and seniors to help them navigate decisions and plans that will lead them to achieve their goals beyond Canby High. "ASPIRE mentors meet regularly with students, in the presence of school staff, and assist with development of a post high school education plan," Bailey said. "They provide encouragement, information and technical assistance for financial aid and admissions applications." The team acknowledges that every student's future is different and may include university, community college, vocational/technical schools or apprenticeship programs. "It's their path; it's not our path," said School to Career Coordinator Sue Winner. "But it's just helping them with their path." As for reaching that 10-volunteer goal, the team said that anyone who is interested in helping students in this way just need to be 18 years or older and pass a background check. Current volunteers include a former school nurse, an engineer and a mom who sent kids to college. "My background was that I had already sent two children to college, and I wanted to volunteer when my youngest was at the high school," Kaufman said. Current mentors visit the school to meet with students once per week, but volunteers can set their own time commitment (within school hours).